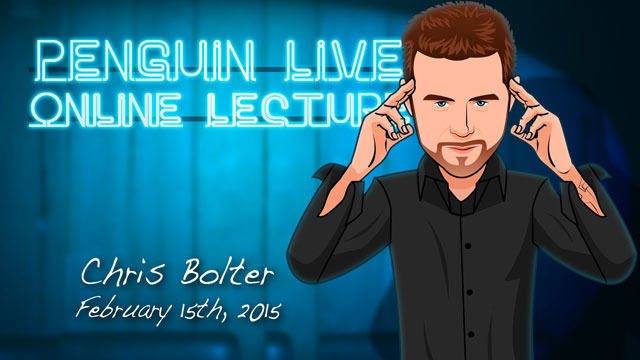 Today, when you order "Chris Bolter LIVE", you'll instantly be emailed a Penguin Magic gift certificate. You can spend it on anything you like at Penguin, just like cash. Just complete your order as normal, and within seconds you'll get an email with your gift certificate. Chris Bolter LIVE (Penguin LIVE) Classic mentalism principles repurposed to entertain even more! SUPPORT LIVE MAGIC. DOWNLOAD THE FULL LECTURE TODAY. The Blindfold Routine: A classic of mentalism for many years. Chris will demonstrate his unique presentation for this incredible routine! The Magic Square: Another memorable routine performed by Chris with some great new touches and tips. This is one of his most requested routines with repeat clients! Pegasus Page: An easy-to-do new method that allows you begin and end totally clean! Not to mention the whole routine that accompanies the method. The Vision Wallet & Peek Thoughts: There have been hundreds of different peek devices released over the last few decades alone. Chris shows his simple, straight to the point preferred version. Along with tips and subtleties on how to get the most from your peek. 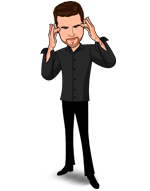 Mentalism with Playing Cards: Chris will demonstrate some of his pet routines that incorporate both mentalism and yes… sleight of hand! These include “Unusual Perception” & “Three Card Opener". The New World Tossed Deck: A new tossed deck you can perform both close up and on stage! This allows your audience to see all of the faces of the deck and still make a free choice! Thoughts on Q&A: Chris performs his Q&A routine more than any other routine in his repertoire, mainly because it’s requested for almost ALL of his live performances around the world. Tips During Live Shows: Chris will also show his tips and tricks to use during these routines and during your own live shows! Bonus: Chris will show you how he sets up and organizes his show. From how to pack, what to bring, and how to make the most without carrying huge trunks into your gig! Christopher Bolter has been performing non-stop since he was 9 years old. You can find him hopping from college to college all over the country! 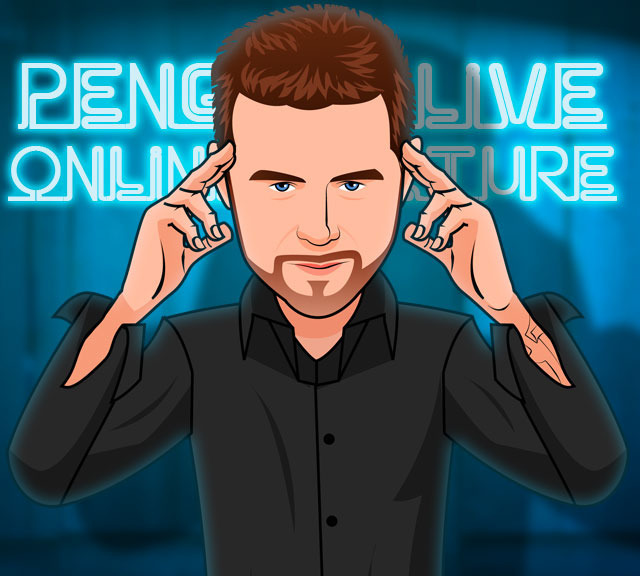 Chris has performed his unique blend of mentalism and psychological mind reading at over 350 campuses from Los Angeles to London. Also, Chris is a regular guest for corporations such as Apple, Microsoft, Bank of America, Price Waterhouse, Meryl Lynch and Matel. Some of his Hollywood credits include performing for celebrities like Steve Martin, Johnny Depp, Ryan Gosling and Avril Lavigne. Christopher is a favorite among some of the biggest names in show business! Having performed at The World Famous Magic Castle on multiple occasions, Chris was asked to release some of his methods to the magic & mentalism world! Now is the time! Chris' lecture will take you through some of his pet material which includes classics such as the tossed deck, magic square, pegasus page and more. This is one lecture you don't want to miss! Purchase the Chris Bolter LIVE product. This is your ticket. Sit back and watch over 2 hours of DVD-quality live streaming magic from the comfort of your own home. It'll be waiting for you in your MyPenguinMagic area. Rehash, Not one thing that even got me thinking of something I mite someday possibly want to find a better way to do. Here Chris combines two routines (Divining a serial number and the magic square) and creating a Frankenstein routine! What's the point? Wouldn't it be better to have the Number offered for the Magic Square from a participants mind. Not some contrived adding of numbers? Again “borrowing” from John Archer (with out credit to) on the crib sheet set up for the Magic Square. If you want to learn this routine go directly to the source, Tragic Square found on Educating Archer by John Archer DVD. A lot of set up for a “mental magic” effect. Over three minutes of instruction and procedure before the moment of astonishment occurs. There are certainly more entertaining and baffling versions being performed. Here Chris offers you his lazy and cheap man's version of David Regal’s Tossed out deck. If you’re looking for a great version of the tossed out deck… keep looking and look at Tossed Out Deck from David Regal, John Archer, Gazo, Wayne Dobson or this performers favorite “because of psychological nuances” Cody Fisher’s Tossed Out Deck. This can serve as a beginners overview of the classics of mentalism. There was not a lot to recommend it for anything new, ground-breaking or inspirational... but maybe that's not its strength. If you want to know "what this mentalism stuff is all about" you might find useful info here... but if you've been in it for a while there's nothing new here. Chris Bolter seems like a nice guy - friendly, easy to like as a performer. His mentalism, not so much. Weak routines combined with scant original thinking and few useful insights make this a lecture worth passing up. 'Nuff said. Chris's lecture was great with real world routines that any working pro can use and benefit from. Great job Chris. This lecture is full of practical, workable material by a full-time working mentalist. I especially enjoyed the detailed discussion on Chris' Q&A routine, which is very easy to do (2:01 - 2:30 on the video). Most of what Chris Bolter taught were fundamental mentalism effects with some new handling. However, Chris Bolter gave a solid lecture and worked hard explaining every effect thoroughly. His presentation style is relaxed and he uses humor effectively. He comes across as likable. Unfortunately, I felt I could not use his material as is, but his material did stimulate my thinking. Often, I was able to see ways to carry the ideas one step further to make them punch harder. There is nothing wrong with using well known effects to entertain a lay audience, and I think that is Chris' main goal. I think he accomplishes that goal. If you're new to mentalism, this is a good foundation lecture. Chris Bolter's lecture was packed with goodies and solid info! He kept it moving along and didn't get caught up in long discussions that killed time that happens so often. You know he's a pro as his material is well researched and the methods are simple enough to give the performer plenty of interaction with the audience. I will be using some of these goodies and having fun with them. Definitely one of the better lectures!